Lego Bricks of Life- All PBL Cases Please contact 31 6 33010931 To buy this summary instead! It is €5 instead of €5,50 and you can pay without needing a paypal. This is a 52 page document with all the information you need to revise the PBL cases of the Lego Bricks of Life course. Everything is explained clearly with diagrams, headings and bullet points, and with information from a variety of sources (Albert's The Cell, iGenetics, Khan Academy, etc). The shortest any case is is 2 pages fro Case 11 (BLAST) and the longest is 10 pages for Case 9 (Cell Communication) because I thought it was the trickiest, and thus took the time to explain everything fully. Hope it helps you pass your exam! Samenvatting Moleculaire Genetica 2 Samenvatting Moleculaire Genetica Colleges Mr. Noteborn - Biofarmaceutische Wetenschappen - Universiteit Leiden LET OP! Tentamenstof voor BFW. Voor LST-ers is deze samenvatting incompleet ivm het ontbreken van gentechnologie! Samenvatting Moleculaire Celbiologie, 2017, Collegeslides & Boek Molecular Cell Biology at TU / e, 2016-2017, book and lecture slides combined in comprehensive summary. Summary - The lego bricks of life Summary of course 1 - The lego bricks of life. This summary contains a lot of details and clear pictures. THe summary follows the cases, which are worked out per case. Clear explanations for important subjects like DNA replication, transcription, translation, post-translational modifications, eukaryotes vs. prokaryotes, membrane transport, osmosis, endosymbiosus, mitochondria and cellular respiration, tissue types, cell signaling, mutations, BLAST, phylogenetics, mendelian inheritance, Lamarck and Darwin. Celbiologie 2 samenvatting Dit document bevat een gehele samenvatting van alle colleges celbiologie 2 aan de RUG. Genoom deeltoets 2 Technieken en onderzoek Samenvatting van alle technieken voor deeltoets 2 van genoom. Het is een samenvatting van de WC's, HC's en Alberts. MBoC College aantekeningen College aantekeningen van de cursus Moleculaire Biologie van de Cel, aangevuld met informatie uit het studieboek \"Molecular Biology of the Cell - Alberts\". Moleculaire Genetica 1 Oefententamen met antwoorden 2016 Het oefententamen van Moleculaire Genetica 1, de vragen met de antwoorden. Cancer Biology week 3 - RNA Notes in detail about RNA, from the basics to their role in cancer. BIOL211 - Cell Biology Complete detailed set of notes for a 2nd year Cell Biology module; these notes allowed the achievement of a 1st in the final exam for this module. Cancer Biology week 1 & 2- DNA Notes in detail about the DNA structure, function, damage and methods of repair focused on cancer. Priming of Naive T Cells Notes on the activation of T cells by antigen presenting cells (dendritic cells, macrophages and B cells). College 1 Eggen Aantekeningen van het hoorcollege, uitgewerkt met het boek en de dia\'s. Zeer volledig en precies. De belangrijke, veel besproken figuren zitten in deze aantekeningen. 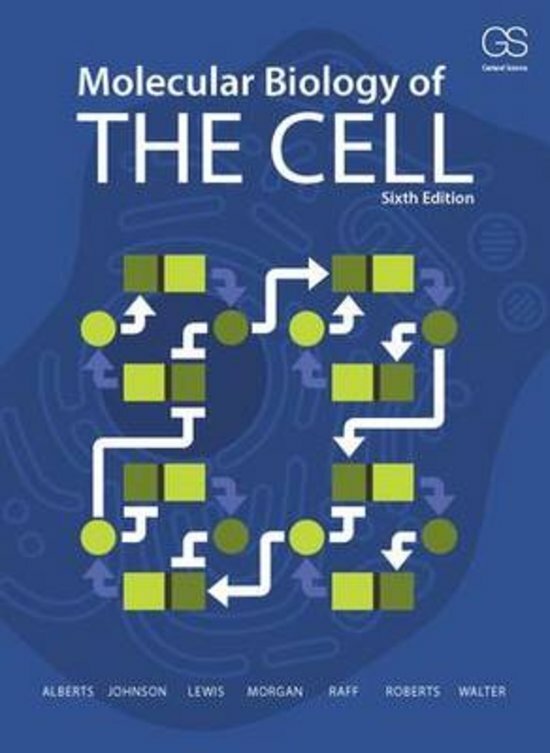 Op deze pagina vind je samenvattingen voor het boek Molecular Biology of the Cell, geschreven door Bruce Alberts & Alexander Johnson. De samenvattingen zijn door studenten zelf geschreven, waardoor je de inhoud van het boek nog beter kunt begrijpen. Denk aan uitleg over [*TAG1*], [*TAG2*], [*TAG3*], [*TAG4*] en [*TAG5*].